Fans line up to hear how Bethesda plans to save Fallout 76. The line-waiter was talking about an upcoming panel discussion with some of Fallout 76’s developers, including director Todd Howard. But the live panel came and came and went without incident. No one asked awkward questions. No one heckled. No one threw a plastic Fallout 76 bag loaded with rotten tomatoes at the developers. Whatever people on the internet might say about Fallout 76, or Bethesda in the wake of its terrible launch, the fans at Bethesda’s Game Days event haven’t lost faith. “From what I heard, it sounds like they’re making Fallout 76 into a game I actually want to play,” Nadav Kolodner, a fan and modder of previous Fallout games told Kotaku at the event while sitting at the bar. He abandoned the game after only playing for around six hours the weekend the game launched and doesn’t remember the period fondly. “People were crashing servers, and taking game-breaking items and bringing them into starter areas, and setting off nukes that blew up the whole map to crash servers,” he said. Kolodner was referencing an incident from the first weekend when a number of players who had reached the end-game from playing during the beta period crashed the server they were on by launching too many nukes at once. Kolodner, like a bunch of people, was turned off by how unstable Fallout 76 was when it launched, and all of the disparities between the vision Howard had shared on stage at Bethesda’s E3 press event and the actual experience people were able to play. “When a studio comes out and they say that a game is going to be one of the greatest they’ve ever made, when they say it’s going to be open world, when they say it’s not going to be broken, that it’ll be balanced, and we’re going to be able to have hours and hours of fun and you’re going to be able to have this occupy maybe a year of play time, and then it comes out and it’s a buggy mess and servers are crashing and they didn’t iron any of this out in the beta, then it’s just kind of puzzling to me,” he said. Bethesda did not go easy on the bartenders. 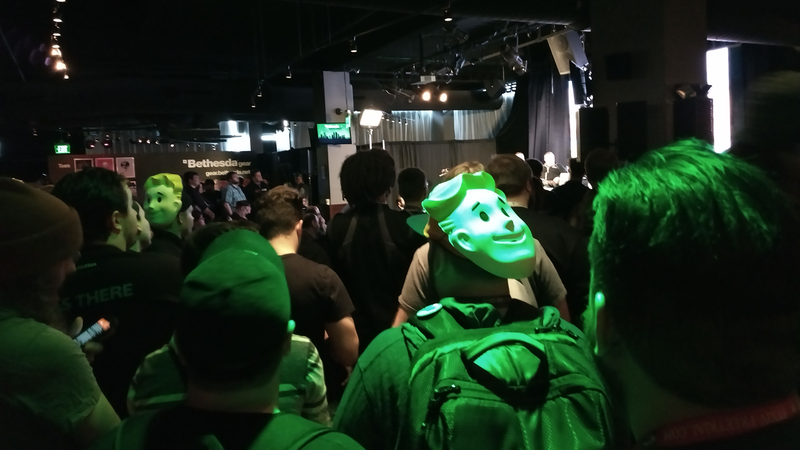 This is the second year that Bethesda has hosted a fan event adjacent to PAX East. Across the street from the Boston Convention And Exhibition Center, a motley collection of gamers descends on an Irish pub and the comedy theater above it to pay homage to the company responsible for some of the best open world role-playing games ever made. Or to play the hands-on demos for Rage 2. And in some cases, just to snag the free T-shirts Bethesda gives out. There’s also free booze and food for anyone who happens to show up, which is part of why the event attracts a line that snakes out into the lobby of the adjoining hotel. Whether it’s the Fallout and Elder Scrolls-themed cocktails or the piles of hamburger sliders and baked macaroni sun-bathing beneath pale heat lamps, the people I talked to inside were, for the most part, all onboard with what Bethesda is doing with Fallout 76 going forward. Those plans, best summarized in a year-long roadmap that Bethesda released in February, revolve around rolling out timed seasonal events, slowly adding new gameplay features, and eventually introducing dungeons, four-player raids, and more story content. In the over 100 days since it came out, Fallout 76 has received seven numbered patches and plenty of hotfixes. Some have improved stability and removed bugs, while others have done just the opposite. The latest updates have also been adding new content, though, which has given players something more positive to focus on. In the update titled Wild Appalachia, the highlight so far has been the Fasnacht Parade, a time-limited event where players teamed up on the main street of Helvetia to take down a legendary sloth and earn rare masks. It’s brought people together in a way the game’s existing public events and end-game nukes hadn’t. It’s also shown that the Fallout 76 experience can meaningfully evolve from whereit began. The Fallout 76 panel at Bethesda Game Days, from left to right: Chris Mayer (development director), Nate Purkeypile (senior artist), Sean Baptiste (influencer manager), Jess Finster (senior community manager), Todd Howard (executive producer), Ferret Baudoin (senior designer). Galvin came to the event with his friend Derek Tee, who said he sees events like Fasnacht as a way out of that. “If it’s meaningful in the world in some way and has other players coming together for a common goal, I see that as a good option,” he said. The loneliness in the game goes beyond just the options for engaging with other players, though. Everyone I spoke with at the event was also desperate for Bethesda to add non-player characters to the world. Fans who attended the event were given T-shirts and Vault Boy masks to commemorate the occasion and terrify people they meet on the street. The panel discussion at PAX East made him more confident about the future of the game, he said.. “I think the fact that they’re acknowledging that it’s been a bumpy road—like, a really bumpy road—they’re not just like, ‘Oh, whatever, we’ll get past it.’ They’re actually paying attention and listening,” he said. “That makes me feel a lot better.” Southwell said he was talking specifically about a moment early in the panel discussion, when director Howard talked about the game’s “ups and downs.” For the Bethesda diehards, that’s apparently enough. Another fan, Jessica Kelley, said she is so happy with where Fallout 76 has gotten to after its rough start that she’s started spending more money on it. Her first big spend was upgrading her account to the $80 Tricentennial Edition, which netted her the celebratory Vault Boy saluting emote. While Kelley agrees that the beta could have gone on longer and things could have been handled better, she wouldn’t have wanted Bethesda to delay the game to fix its issues..
“I think if it was released now, people wouldn’t have been as upset, but I think you’re always going to have a vocal minority that are going to be very loud and very angry about things they didn’t like,” she said.